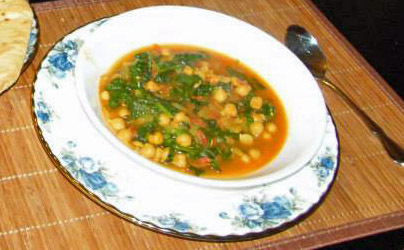 Today we’re going to do a non-traditional, slightly subversive take on an Indian dish – Chana Palak (chickpeas and spinach). My partner maintains chana palak is not traditional Indian cuisine anyway. He swears he never ate it in India and first learned about it when he dined in Indian restaurants in the US. He claims it’s an American invention. 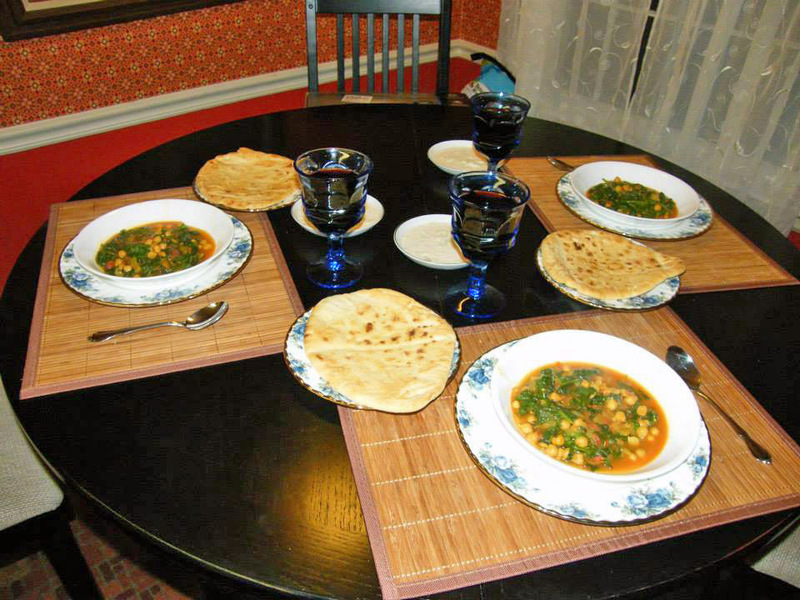 I’m not sure if that’s true or not, but chana palak (or chana saag – chickpeas and greens) is definitely a vegetarian favorite among my non-Indian, American-born friends and cooking students! Heat the oil in a large, deep frying pan over medium-high heat. Once the oil is hot, toss in the cumin seeds and wait for them to “pop,” stirring occasionally so the seeds don’t burn. Add the ground roasted cumin, coriander, salt, chana masala spice blend OR curry powder, and turmeric. Stir until the spices are well-mixed with the onion mixture. This should only take a few moments. Be careful the spices don’t burn. Add the canned tomatoes and the Roma tomato. Add chickpeas and a cup of water or vegetable broth. (You don’t want it to be soupy, but you do want there to be plenty of liquid – because you will be soaking up the “gravy” later with rice or bread). Stir. Bring to a boil, then reduce heat, cover pan, and then let simmer for 5 minutes. Now we’re going to get freaky with the spinach. We’re not going to pressure-cook it, We’re not going to put it in the blender. We’re not going to boil it into weird brown goo. We’re just going to keep stuffing spinach leaves in the pan, stirring and replacing the lid every now and then if necessary to get the spinach to reduce, until we get all the leaves in! 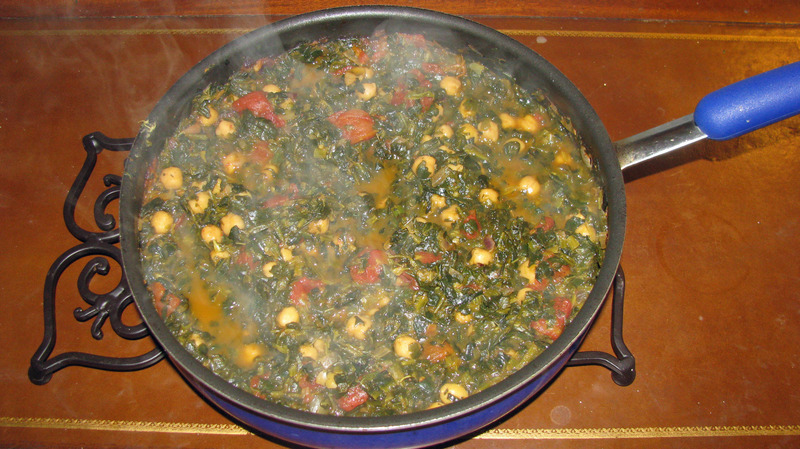 Once all the spinach fits into the pan and is just ever so slightly wilted, add the garam masala. (Garam masala is a finishing touch and should always be added last.) Stir. And then we’re just going to cook for perhaps two or three minutes more – until the spinach is wilted but still green. I’m not gluten-sensitive, so I prefer to eat this with naan. Naan often has dairy, so if you buy pre-made naan read the ingredient list carefully. Harris Teeter has some naans in their regular bread section that are vegan. The gluten-sensitive will want to eat this with basmati rice (here’s a recipe). If desired, top with homemade soy yogurt and cilantro leaves. Or serve with a wedge of lemon or lime. If you don’t have cumin seeds, increase the ground roasted cumin to 1 teaspoon. The Roma tomato is a trick I use to make canned tomatoes taste fresh. But if you don’t have fresh green chilis, replace the fresh Roma tomato with a small can of drained Ro-Tel tomatoes with green chilis. Ro-Tel adds a fresh taste plus the right touch of green chili hotness. If you have neither green chilis nor Ro-Tel tomatoes, add a pinch of cayenne pepper. Unless you’re really familiar with your hotness level, start with 1/8 teaspoon and work your way up. Yes, this is one of the few recipes where I give you permission to use curry powder in an Indian recipe. Why? Because curry powder tastes very similar to chana masala spice blend, so in this case it works. This is also one of the very few recipes I ever make with vegetable broth. You may not need it, but it’s good to have some on hand in case your chana palak gets a little too thick or dry. In normal circumstances you could just add more water and simmer a while longer for the water to pick up the flavor, but in this Americanized version we’re trying to avoid overcooking the spinach. Table set for me and two of the students in my vegan cooking class. So did the boyfriend enjoy it or will he not eat it because it’s not traditional? 🙂 I love all your simple shortcuts. Dishes that can take place in one pan are winners to me. Thanks! One pot meals ARE nice .. As to your other questions, no, I don’t think I even got him to taste it! Oh, well! He likes most of what I cook, and this was one recipe I really created for my other friends. So do I! I grew up in the South eating lots of greens – spinach, collards, turnip greens, kale – so you can imagine my shock the first time I saw my partner stuffing all those lovely greens into a blender! lol on the immersion blender. It looks like a hearty and yummy soup. like your shortcuts for a quick and healthy weeknight dinner. Thanks! And I really wasn’t joking … much … about the blender! This looks delicious! 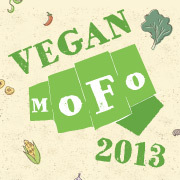 I’ve been thinking of transitioning into a vegan diet actually! Thanks! That’s great that you’re thinking about transitioning to a vegan diet. And transitioning is a great way to do. Just keep adding more and more vegan recipes and foods to your diet. Let me know if you have any questions!